Alrightly, so what do I want to talk about since I found these five days ago and have yet to publish this post? I think my excitement level is low because this is Unilever. These big huge companies are all about market analysis and foo-foo tactics to sell you ice cream. It's like how museum of ice cream pints from Target are disappointing so many people. Sorry, stuck in bitter and jaded mode right now. Let's dive in to this light ice cream. 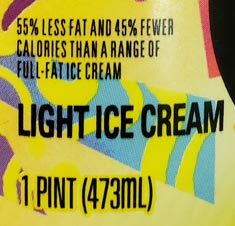 That's right, it's "light" which means it just has to have a certain percentage of fewer calories and fat to be called "light ice cream". Fancy semantic trick right? Each one is different, but the gist is about half the fat and half the calories of "a range of full fat ice cream". Yes, it actually says that on the front (I rounded off because the nutrition facts vary on each flavor). If you check the back, you see that it's comparing it to a 20g/330cal 2/3 cup serving. The good news is that I didn't notice any sugar alcohols while quick checking the labels. Oh, these are also full pint containers, not 14 fluid ounces. 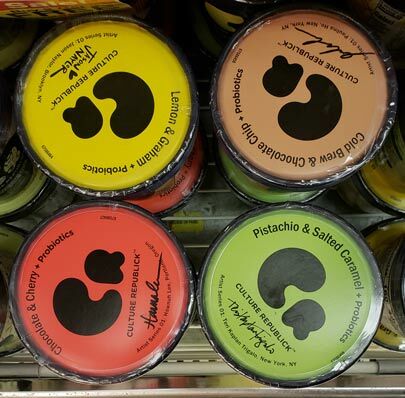 The flavors are all pretty foo-foo as are the pint designs. My favorite instagram comment was the person hoping it was Pac-man ice cream. The flavors I saw were chocolate & cherry, matcha & fudge, cold brew & chocolate chip, lemon & graham, and pistachio & salted caramel. There is also Milk & Honey and Turmeric Chai & Cinnamon. Yes, every sinle flavor is labeled as a mix of two things. There is potential here, but I sound annoyed don't I? I Just Can't Help It. It's unilever. They don't care about us. They care about profit margins. Granted, any healthy business needs to care about profit margins, but everything from product design to their website just screams of trying to hard with a product that could be very lackluster. "So Dubba, why didn't you just buy a pint rather than blabbering endlessly about how you think this will be disappointing?" Well, fair point my friend. I was on my way to pick up pizza for dinner and didn't have any cool packs with me (though I could have rectified that with a bag or two of frozen corn). So yes, I should have, but I hesitated. My because no one flavor screamed out at me. Even if all seven had been there, I probably still would have hesitated. I want to say that I would grab Milk & Honey, but I've had plenty of flavors that went overboard on the honey. So I'll probably go back for Lemon & Graham unless somebody wants to try these first and try to persuade me one way or the other. Let's end with positivity: Each container is designed by an emerging artist and more importantly 10% of profits will "support the Arts in local communities". Oh hey, the website also says that they will be coming out with some non-dairy flavors early next year. (Remember, Unilver first made non-dairy stuff via Ben & Jerry's which led to two non-dairy Breyers flavors as well). They say that you can contact them about being the artist on a future flavor. I think that ingredients list saying "soluble corn fiber" means I'ma gon' be really "windy" after eating that stuff... which is why it's a no-buy for me. I tagged you in my insta post of Lemon & Graham but I’m sure you get tons of tags. It was.... edible. I was able to eat the whole pint. But it had a pretty bad aftertaste. At this point I’m worried the Milk & Honey I also have will have an even funkier aftertaste but I have it light as well try it. If you want to try one for the blog, that makes sense. But you’re right to be suspicious. Also the gimmick of probiotics is lame. 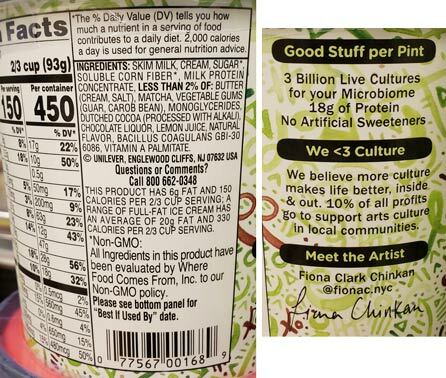 I tried to research into it and there’s tentative positive info about cultured ice cream. But really just get a cup of yogurt and some regular light ice cream. Dubba, I can't help but laugh at your brutal honesty of Unilever. I seriously think they know the power and influence of "On Second Scoop" and they have been secretly following your blog, so now they are trying to appeal to your latest needs for more attention to your GI tract/health, hence the new "Probiotic!" angle. They think they can win you over, Dubba, you savvy consumer. I love your honesty. Now I will be questioning whether or not I should be eating ice cream from a company that also makes my deodorant. Be well, Dubba. @Elizabeth: Yeah, instagram is awful with trying to keep track of getting tagged in photos and comments. That said, I hate terrible aftertastes. It sounds like a glorified frozen yogurt concept. Plus the flavors barely excite me. Please clarify the meaning of “foo foo”. @Sheila: Hi, I'm not 100% sure what you are asking. If you are being literal then "foo foo" to me means overly fancy (or something trying too hard to be fancy). You may also heard the term "foo foo little dog"? 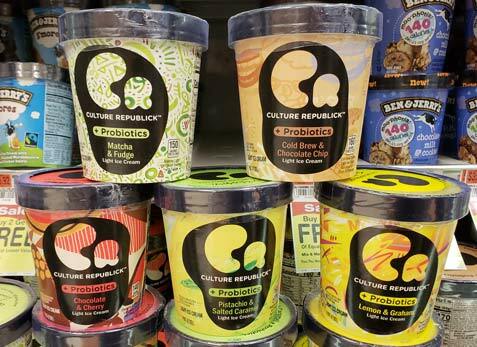 If you are asking how it applies to this product, it's the overly fancy containers with the cutesy logo and trick spelling of republic tagged to flavors that are crying out to be be liked by the cool hip kids. In my experience, a product that tries this hard to be cool is most likely going to fail hard. It's just trying to grab a few dollars of profit before the next marketing fail comes to the freezer aisle. Maybe that Matcha and Fudge would be good, but those other flavors have either been done to death or are boring. 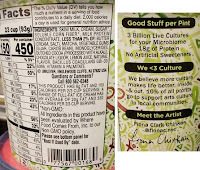 Also how "active" can active cultures be in frozen food? Wouldn't most of them be dead or close to it?